Hitachi has an excellent reputation for quality, and it shines through in this starter saw. It offers excellent accuracy right out of the box, and even new users can get it up and running with little problem. The laser marking system is very useful, giving extra confidence that the blade is cutting where it should. Dust collection is poor, but that seems to be an issue with many saws. For more advanced users, this is not the saw to buy because it is limited in the complexity of cuts it can make. As a first saw, this is a good choice. This saw is an ideal choice for a first miter saw. Rugged, simple to use and dead-on accuracy right out of the box allow new users to produce perfect results every time. This saw is the lightest in its class and can be locked down into a very compact size. The combination makes it very easy to take it to your job. For a first time user, the fact that the saw is accurate out of the box without needing adjustments is a terrific benefit. Users can focus on learning how to cut rather than getting frustrated with set up and angle adjustments. Is the laser worth the extra money if you are only doing rough carpentry like decks and playhouses? Yes, it is. The Hitachi laser is great, and you can turn it off if you don’t want to use it. You might start out with rough projects, but chances are you will eventually want more accuracy. You’ll have the laser when you want it. Can you cut metal with this saw and if so, what type of blade do you need? With the proper blade, you can cut metal with this saw. Go to the store and look for the blade designed for the metal you want to cut. Some are for steel, some for softer metals, and some are combination. Does it have a blade brake? It does not. The blade keeps spinning after you release the trigger but stops rapidly. Just be sure to always keep your fingers clear of the blade, whether spinning or not. What kind of warranty comes with the saw? Hitachi offers an excellent five (5) year warranty, one of the longest in the market. Having this length of warranty is a great advantage over other products. The great majority of users loved this saw, especially those who were first time users of miter saws. Users were typically pleased with the smooth, quiet operation and clean cuts. It did everything these users expected it to do. Users with less positive reactions found issues with the quality of the base, the poor dust collection, and issues with the laser functionality. Value for the money seems to be the consensus with the C10FCH2 from Hitachi. It is an ideal saw for first time users of miter saws. There is minimal assembly required, and accuracy from the factory is excellent. The anti-vibration handle and quiet motor limits user fatigue during extended use. Cuts are smooth, even with the included general purpose 24 tooth blade. However, for fine finish work, a different blade is a must. With all the basic accessories included, this saw will work for new users and occasional projects and is accurate right out of the box. Beware of lemons. Those who did not like the saw frequently reported that the feet of the base either arrived broken or broke early on during use. Unfortunately, many of these users reported that Hitachi did not warranty this defect which is a shame since it occurred often enough to appear to be a manufacturing defect. A variety of other complaints also appear to be specific to the particular saw a user received. Dust collection was another bone of contention as users found the dust port too small to move the dust away from the work piece and into the collection bag or a connected shop vacuum system. This is not so much of an issue working outside but can be a problem in the shop. Laser brightness was noted a few times while other users found it perfect. In some cases, users reported the dimness when using the saw outside so that may be the issue. In all fairness to Hitachi, they are quite explicit in how to compensate for laser dimness on page 9 of the user manual. They tell users it will be dimmer in bright sunlight. Use care in blade replacement. Other users reported that the bolts holding the saw lock guard were over-tightened at the factory. Because of this, there is increased the risk of stripping them during blade changes if the user wasn’t careful. Once stripped, you are not able to rethread easily given the type of metal used in the base. Finally, the legs/holes on the saw base are not parallel to each other making the saw hard to mount on a stand. 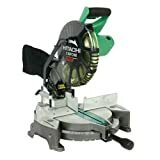 This seems to be an ideal option for the new user or users who have never worked with a miter saw before. The C10FCH2 is a great saw that will handle the basic miter and cutting tasks of the beginning and occasional user easily and accurately. It does seem that some problem saws leave the factory so buyers should inspect their saw thoroughly before first use, especially concerning the saw’s feet. For more advanced and experienced users, they should look at more capable, and expensive, saws.